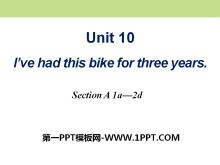 《I've had this bike for three years》PPT课件14 课 前 预 习 【单词】 1. 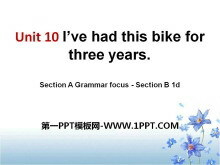 现今，现在，目前 adv. _____________ 2. 搜索；搜查 v.n.________ 3. 在（其）中；之一prep.__________ 4. 彩色铅笔（或粉笔、蜡笔）n. 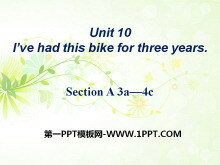 _________ ..
《I've had this bike for three years》PPT课件13 课 前 预 习 【单词】 1. 家乡；故乡 n. __________ 【短语】 2. be back _______ 3. at least ________ 4. for a while____________ 【句型】 5. 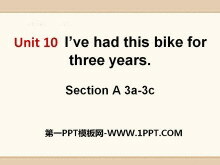 - How long has his son ow..
《I've had this bike for three years》PPT课件12 课 前 预 习 【单词】 1. 院子 n. ________ 2. 甜蜜的，甜的，含糖的 adj.________ 3. 检查；审查v.＆ n.________ 4. 记忆；回忆n. __________ 5. 玩具n. ________ 6. 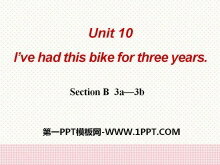 分；分..
《I've had this bike for three years》PPT课件11 课 前 预 习 【单词】 1. 清理；清除v._______ 2. 卧室n. ___________ 3. 地位（或职位、级别）低下的adj._________ 4. 拥有；有v. __________ 5. 铁路；铁道n. 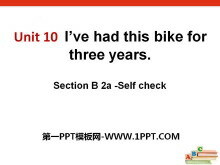 ____________..
《I've had this bike for three years》PPT课件9 Language points (1) millions of 成百万上千万 million 百万，使用时前面如果有基数词修饰时不能加 s 只有与of 连用时才可以加。 Example: There are millions of things liv..
《Have you ever been to a museum?》PPT课件14 课 前 预 习 【单词】 1.一千n. 2. 安全的adj. 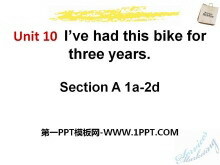 3.仅仅；不过；只adv. 4. 害怕；惧怕v./n. 5.不管；是否conj. 9. 印度的adj.；印度人n. 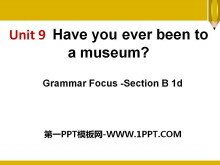 10.日本的；日本人的；日语的adj.；日本人..
《Have you ever been to a museum?》PPT课件13 课 前 预 习 【单词】 1. 德国的；德语的；德国人的/ 德语；德国人n.adj. __________ 2. 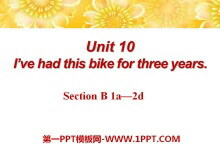 主题n.__________ 3. 短途旅游n._______ 4. 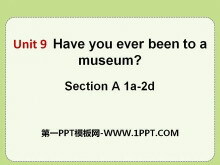 省份n.____________ 【短语】 5. a couple o..
《Have you ever been to a museum?》PPT课件12 课 前 预 习 【单词】 1.发明v.___________ 2.难以置信的adj._______________ 3.进步；进展v.n._____________ 4.迅速的；快速的adj._________ 5.特别的；不寻常的adj._________ ..
《Have you ever been to a museum?》PPT课件11 课 前 预 习 【单词】 1.娱乐；游戏n._______________ 2.在某处；到某处adv.________ 3.照相机;摄影机n.____________ 4.发明；发明物n.____________ 【词组】 5. amusement park..